I ate this ice cream for breakfast today! The "ice cream" is actually just frozen bananas blended into a soft serve or ice cream consistency. I ate the first serving last night, immediately after blending, which was soft, and the second half, returned to the freezer overnight. In the morning, it was firm like ice cream. 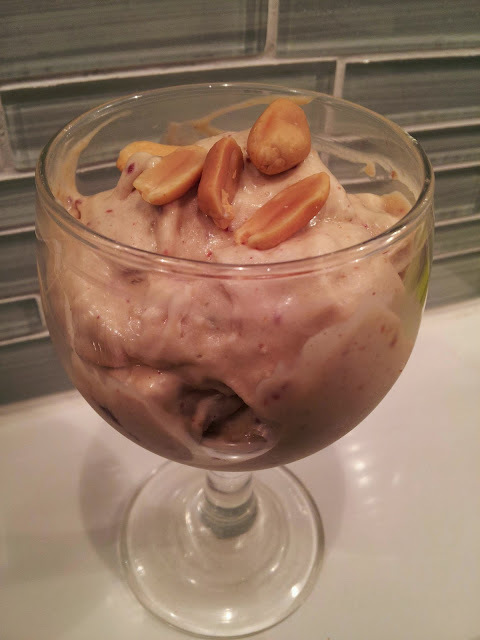 Personally, I enjoyed the ice cream style better, so I recommend freezing it after blending! When bananas are ripe, slice them into medallions, and lay them on to waxed paper in a container and freeze for at least two to three hours before blending. Place all three ingredients in a food processor or high powered blender. Blend for a few seconds, then turn off and scrape the sides of the food processor. Blend again, and repeat as necessary. Pour the contents into a container and return to freezer for ice cream consistency.